Dearest Luvved ones, let me tell you of my luv of the charms of one Wesley Wales Anderson. I admit to being a late bloomer, I came in at Rushmore when those much more perceptive than I (- which isn’t saying much) caught the bliss at Bottle Rocket. Still, once bitten by the intelligent, dry wit of his scripts, the unique character renderings, the Impressionist-inspired cinematography, and the groovy soundtracks, the hook is still firmly implanted in my trunk. Watching a Wes Anderson film always feels like being allowed to hang out with the witty, art-school kids you admired when you 14. There have been some tests of faith (- The Life Aquatic with Steve Zissou, in particular at the bottom of my W.A. faves list, but that list is all relative), and I started to fear that Anderson was losing sight of the innovativeness that was such a hallmark. 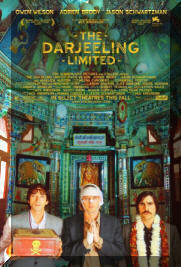 But fear not, elephant herd, for we have much cause to rejoice in Mr. Anderson’s latest offering The Darjeeling Limited. 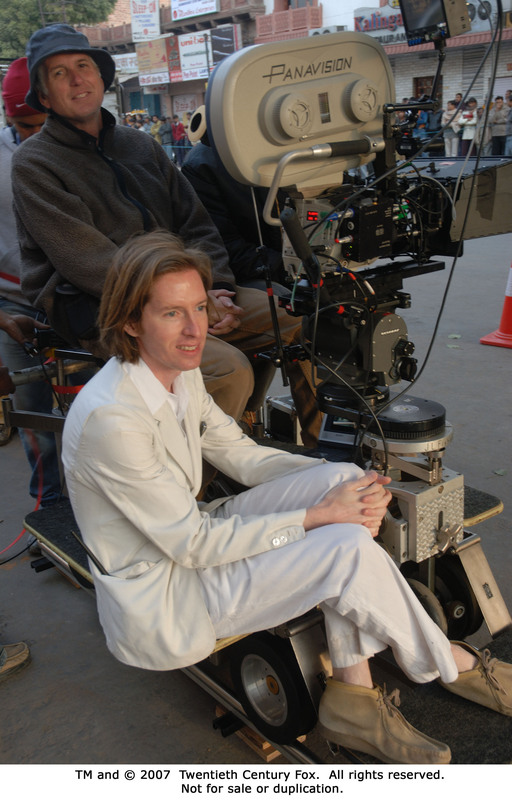 In one film Anderson has captured many of the themes he’s explored through his film career and wrapped them in a paisley-covered package topped in a Saffron bow. 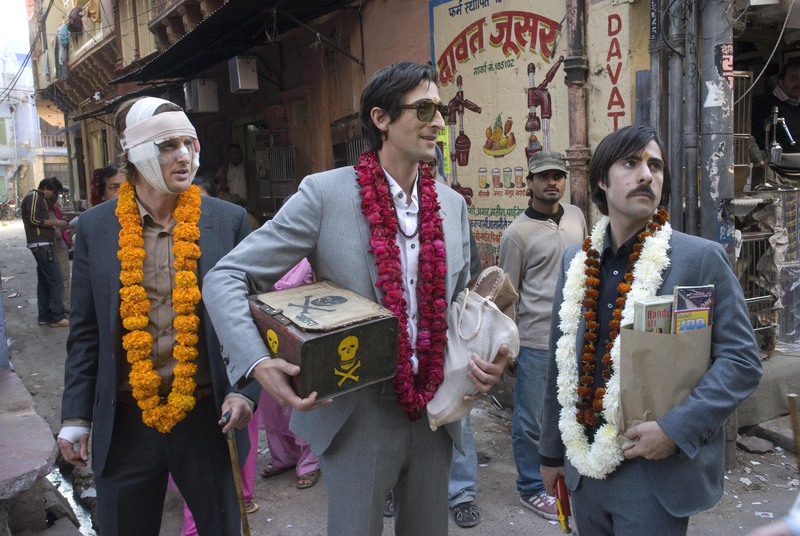 The Darjeeling Limited starts off with a car careening down dry dusty streets to nifty spy music played frantically on a sitar. Bill Murray exhorts his turbaned taxi driver to proceed with all haste. Racing to catch a technicolour blue locomotive (- decorated with elephants!) pulling away from the station, Murray is passed by a young man in sunglasses who hoists his baggage over the caboose gate then sprints onto the train himself leaving Murray panting in the distance. With the exception of Bottle Rocket, all of Anderson’s features have included Murray as their linchpin. The scene in the railway station reads like an affectionate passing of the torch from Murray to whatever the future of Anderson’s films holds without him. It also serves to let the audience know we are heading into undiscovered country. 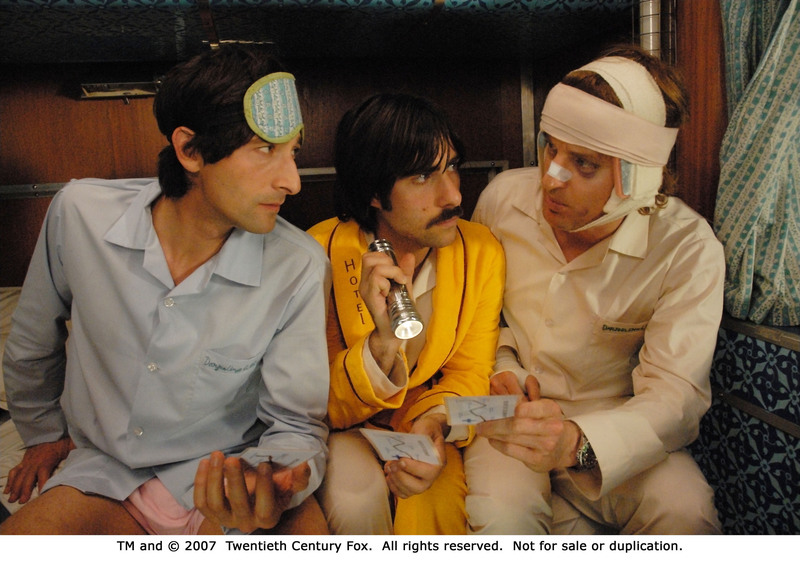 That leap onto the train is made by Peter Whitman (Adrien Brody), an American meeting his two brothers, elder Francis (Owen Wilson) and younger Jack (Jason Schwartzman) in a bonding experiment concocted by Francis a year after the death of their father; a year in which the three siblings have had precious little contact. Francis’ stringent itinerary dictates start the trip on the wrong foot and the boys bicker, squabble and set up factions amongst themselves the entire length of the train ride, and it isn’t long before the brothers’ tenuous détente devolves into recriminations and fisticuffs. 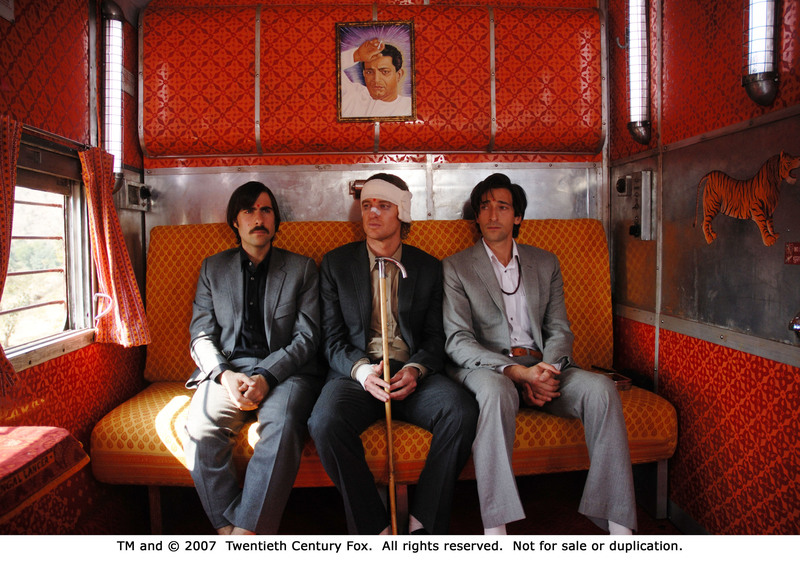 The locomotive, The Darjeeling Limited, is the placid backdrop for the brothers’ rising tempers as it tours them across India, seemingly with no destination in mind. 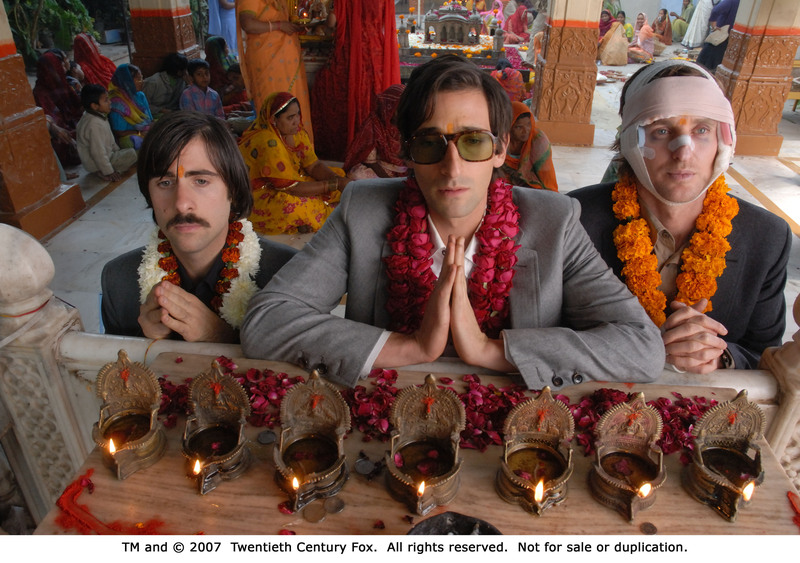 The staff of the Limited is also changed by their interaction with the Whitmans: Rita (Amara Karan), a lovely young stewardess, is seduced by Jack and their fling furthers her yearning to leave the Darjeeling Limited and find a new way of life. Her fiancé, the Limited’s Chief Steward (Waris Ahluwalia), finds his steady, aloof dignity challenged by the antics of the Whitmans before finally reaching his limit. He expels the brothers from the safety of the train where they are forced to rely on each other to make their way through the unknown country. Each brother joins the trip with baggage more heavy and complex than the fabulous Louis Vuitton set they lug along behind them. Jack is a writer attempting to finish his latest “novel” and trying to escape a toxic on-again-off-again relationship by hooking up with the nearest willing participant. Peter is running away from his responsibilities as a soon-to-be father, while clinging to a childlike vision of his departed dad and his place amongst his two brothers. Francis has survived a terrible motorcycle crash which has left him barely recognisable with his head wrapped mummy-like in bandages. Like Peter, Francis is trapped in a stunted maturity, ordering his brothers about the way they were ordered as children. Francis also has an ulterior motive for their journey; their bonding experiment is to be topped off with a trip to the remote mountainside convent where their runaway mother is a nun. Family issues galore, folks. As the train segment of their trip is cut short due to the brothers’ adventures in poisonous snake handling, they venture from town to town on foot or by local transport. They find themselves at a riverbed in time to try to save some young boys from drowning. That experience, and the brothers’ interaction with the members of the young boys’ village, marks a new chapter for all three brothers. Forced to live outside of themselves in this foreign, beautiful place where life is so fragile and unpredictable, the fears and issues that have shackled them and kept them needy and immature are put aside and the siblings grow into men before our eyes. There is a flashback sequence that shows the brothers on the day of their father’s funeral the year before and at the point in the film looks dated when we see how petty the brothers were then and how far the men have come since. Even in the inevitable meeting with their selfish, emotionally distant mother, who has abandoned the care of her sons to lead for a school full of orphans in the Indian mountainside, the change in the men is apparent. Patricia’s rejection of them - yet again - doesn’t give them pause as they’ve moved on and it seems that despite all the setbacks and all going against it the journey has worked it’s magic. Another wonderful counterpoint in the flashback is how gray, claustrophobic and dreary the scene in New York is filmed as opposed to the bright bursting colour that intensifies as the brothers further their journey through India, to the magnificent, broad landscapes filmed at the foot of the Himalayas, their possibilities now as wide and untold as the marvelous scenery around them. Before the close of the film, the remaining loose ends and outlying tales of the supporting characters are wrapped up in storybook fashion with the cars on the train posing each character inside a life size diorama of what became of them. It’s a sweet ending to the tale. Anderson’s films often hold a strange detachment as if you’re watching the characters through a goldfish bowl; Wes Anderson’s dry, objective voice which renders the most unfortunate situations with an almost microscope-view unreality. It takes a brilliant performer to render dialog clever and pithy in the almost the nearly monotone delivery that’s a trademark of an Anderson film, and make those lines mean something to the audience. 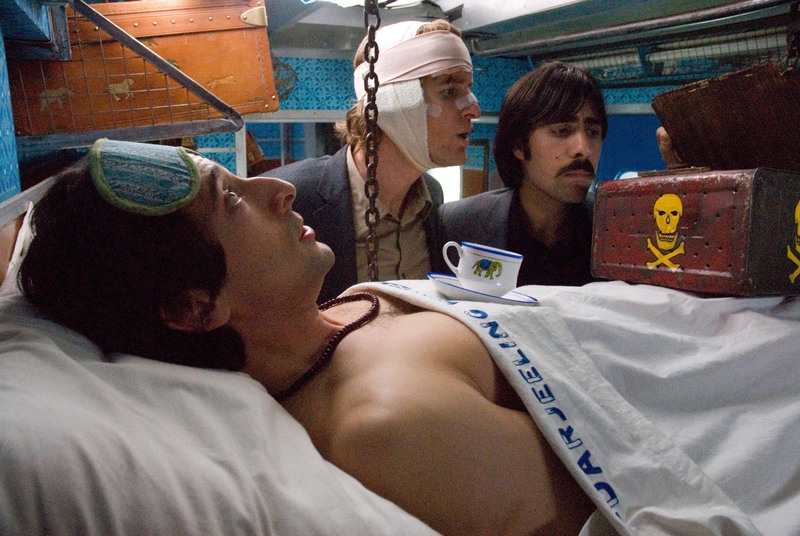 I found The Darjeeling Limited to be Anderson’s most emotional film. Anderson’s story of the Whitman brothers transcends the layers of self-satisfied, intellectual distance that threaten his films (- The Life Aquatic with Steve Zissou) and brings us what is probably his most straightforward, emotional story since Rushmore. While we have the classic Anderson subplots and quirky characters along the way, the focus is directly held on the relationship of the siblings. 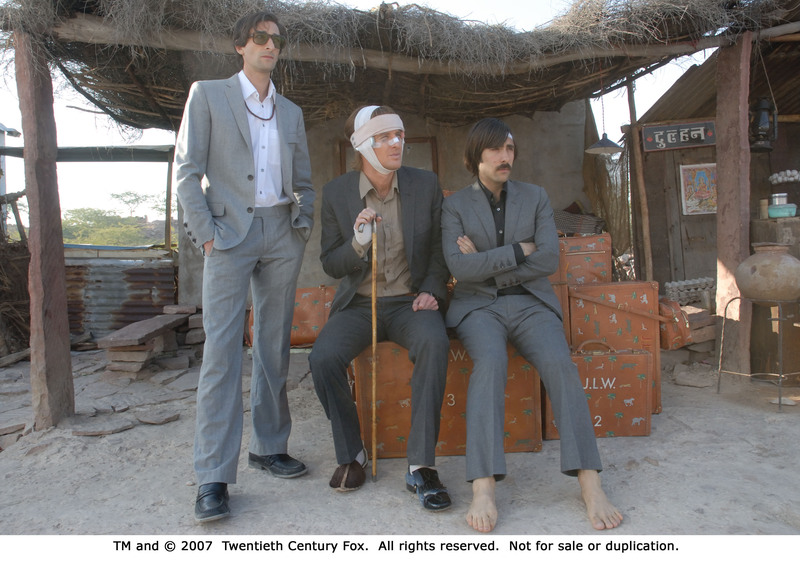 The wonderful portrayals of the Whitmans by Mssrs, Wilson Brody and Schwartzman make these characters and their exploits touching. As a fan of each of these actors, I was thrilled just to see them in a film together (- the three best-loved proboscises on film since Durante), and as brothers they exhibit a fantastic chemistry together. There is an unintentionally chilling scene with Owen Wilson recounting the motorcycle accident that nearly killed him as the impetus for initiating this quest to grow closer to his brothers and it gave me a terrible shudder to think of the parallels of this story and narrowly averted tragedies reported in the actor’s real life. It makes Francis’ optimism that the bonding experiment will work and fix the missing pieces in their lives all the more poignant. The perfect casting of newcomer Amara Karan as the yearning, wistful train stewardess Rita, and The Life Aquatic’s Waris Ahluwalia as the hysterically-affronted, noble Chief Steward made me wish for a spinoff film for their characters. Angelica Huston’s small role as the boys’ mother is a wonderful moment for her and gives us the opportunity to see where much of the brothers’ dysfunction comes from. Her self-serving speech to the boys who rightfully question her mothering skills could easily have made her a last minute villain, but Patricia’s utter unself-conscious belief in her justifications for abandoning her children is clearly true to her. Like her children, you just can’t hate her for her misguided maternal sense. 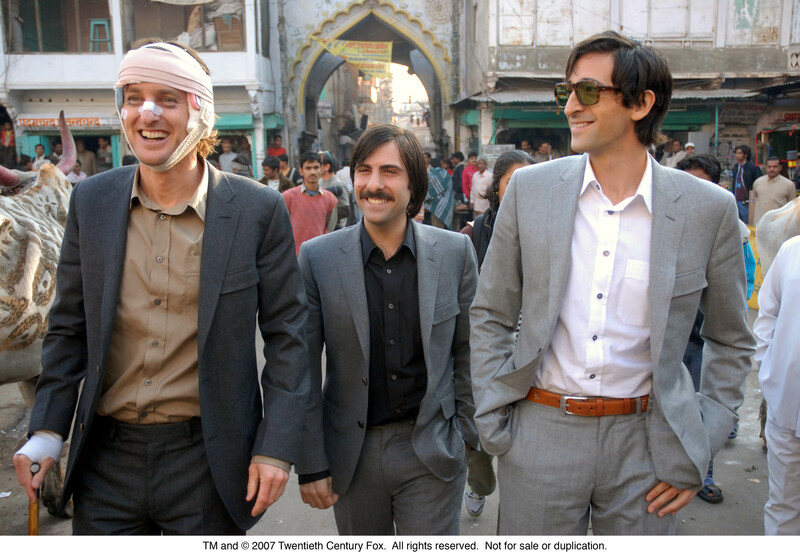 The Darjeeling Limited is Wes Anderson’s most touching and sentimental film to date. Not only does it note the coming of age for a trio of brothers, but for Anderson himself as a storyteller. I adored it. PS: I was also lucky enough to see the Wes Anderson short film, The Hotel Chevalier, before the screening of The Darjeeling Limited. I understand the short is available on ITunes, but doesn’t play before TDL in theatres. By all means, watch this great short before you head off the cinema. The preface story of Jack Whitman in the days before his trip to join his brothers in India, holed up in a Paris hotel hiding from the former girlfriend (- Natalie Portman, wearing nothing but a pair of socks), who finds him and invades his life once again. Great fun on its own, it does a boon in deepening the story of what makes Jack run in TDL. The lived-in look of the hotel, replete with art books and tchotchkes all around the room, the smart, snappy dialogue and great turns by Schwartzman and Portman as the beguiled and beguiling make the short a perfect appetizer for The Darjeeling Limited’s main course.